Xmas in Twickenham with kids, family and friends. What to do list for November, December 2012. 30th November: Christmas lights switch On, King street at 6.30 pm and Santa’s Grotto, Punch and Judy in the Square and Sizzling Hog Roast & Kneller Hall Military Band etc. 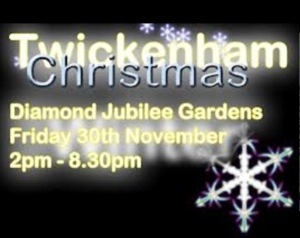 Christmas Market in the Diamond Jubilee Gardens, Riverside – there will also be a Hog Roast, Mulled Wine and local bands. 1st December : Al Fresco Steel Band, Barclays Bank Tree from 11.30 a.m. To 2.30 p.m.
7th-9th December: French Market on Church street with Santa’s Grotto on 8th and 9th December. 9th December: Tempo Tots Choir at The Square 11.30 Plus Carol Singing by members of the cast of “Les Miserables” and “The Phantom of the Opera” takes place by the big Xmas tree outside the Barclays Bank. 16th December: Twickenham Green Christmas Fayre (Carol Singing, Market and Community Events) & Carol Service at St Mary’s Church at 6pm. 17th December: st Mary’s School Carol Service at St Mary’s Church 6 pm. *****************************************************************************************************************************29th December: Harlequins Big Game at Twickenham Stadium, the highlight of the Christmas Season against London Irish is fast approaching with ticket prices starting at £10.